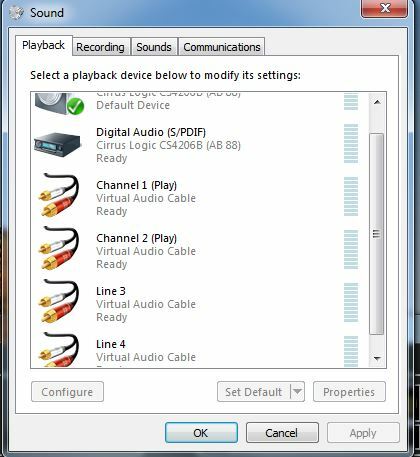 These are the settings I am using with my original Flex 3000 and now upgraded to 5000 running on Microsoft Windows 7 on an Apple Mac Mini using the Bootcamp partition. I will try to keep this document up to date as I make changes. I’ll also describe why I have made certain settings if I feel it is warranted. 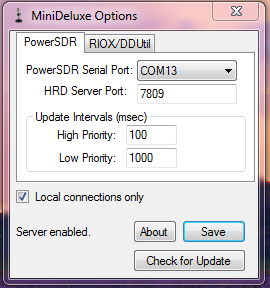 The first thing I did was install the current version of Power SDR (2.4.4). 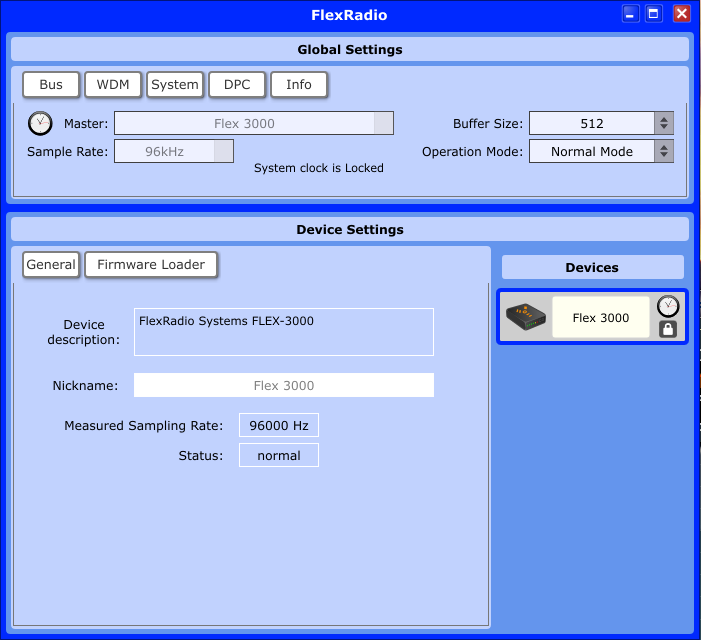 I initially configured it as recommended in the Flex 3000 installation instructions. I set it up with a buffer of 512 and Operation Mode of Normal since I have a fast PC. You set the buffer and Sample rate in the PSDR configuration, not on this screen. 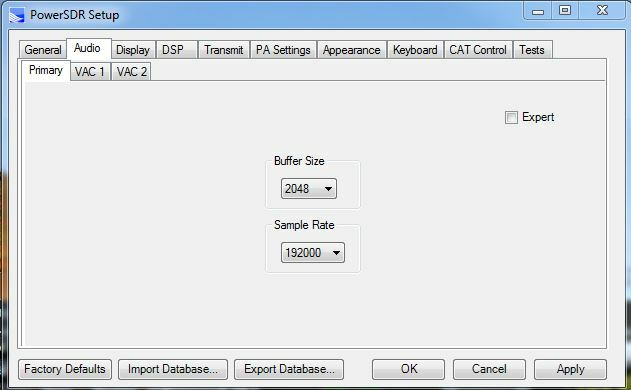 After installation I only did minimal configuration, set buffer size and sample rate and would do the rest later. I then powered it up just to make sure it was working. Then I started on installing and configuring the accessory programs. Because I had been using the Flex on my development PC I knew what else I would need right away, DDUtil for interfacing most other programs, VAC for routing audio to and from digital mode programs, VSP Manager for the com ports I would need and VoiceKeyer for voice memory keying. 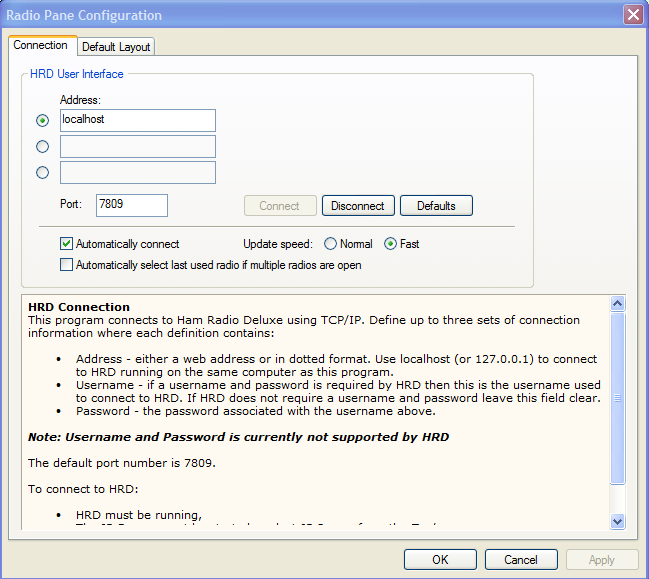 I also use Mini Deluxe to emulate HRD I now use DDUtil since the Mini Deluxe functionality has been included for the HRD Logbook program and DM780 for digital modes. For CW I use CWGet and CWType. Having already installed and configured almost everything once before made it easier since I already had settings that worked. NOTE: At this point I moved on to configuring all the other programs. 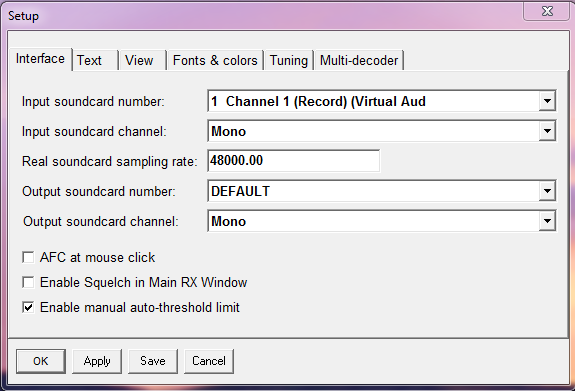 When I finished I went into the PSDR setup and customized it the way I wanted. 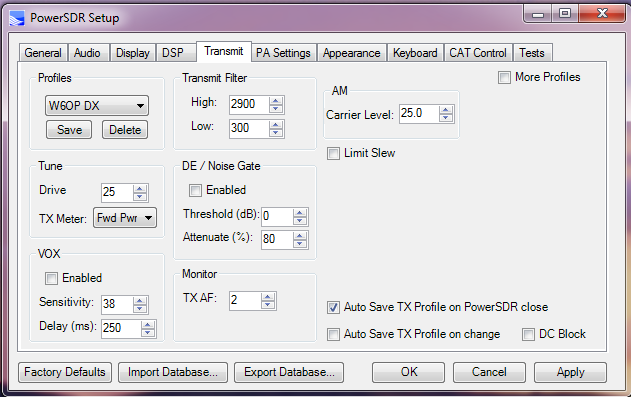 My PSDR settings are further down in this post after I finished everything else. 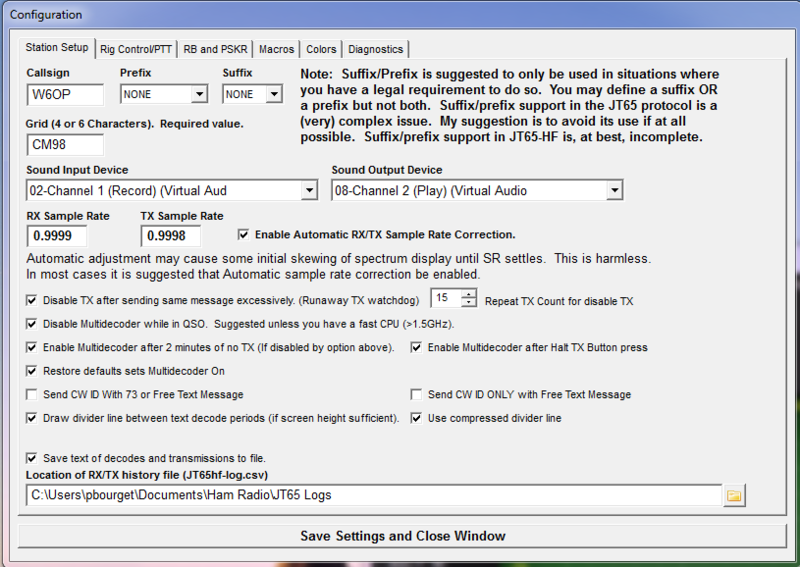 The PSDR settings I have work well for me but I am sure more experienced users may have suggestions to improve them. As it is, I am continually making minor changes always trying to get a little more out of the radio. 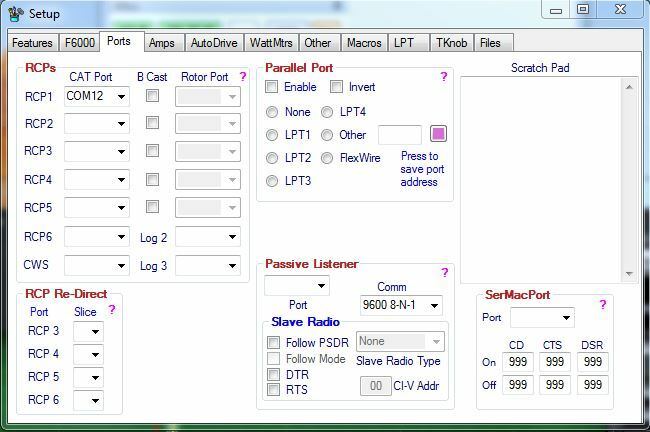 One great thing about using the Mac Mini, and maybe some of the newer PCs, is there are no serial ports defined so you don’t have any conflicts to worry about. 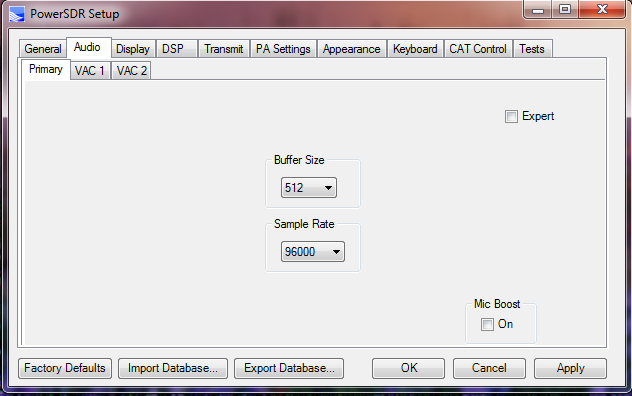 Since I already had a good idea where to start I configured VAC first. 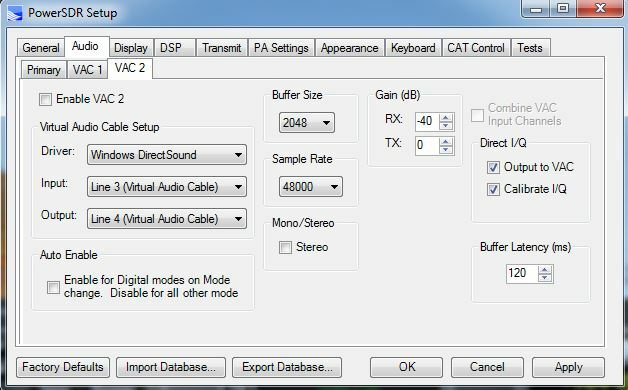 When you install VAC you end up with one virtual audio cable, you need to go in to the VAC console and add a second one. Mine are set as shown in the following image. 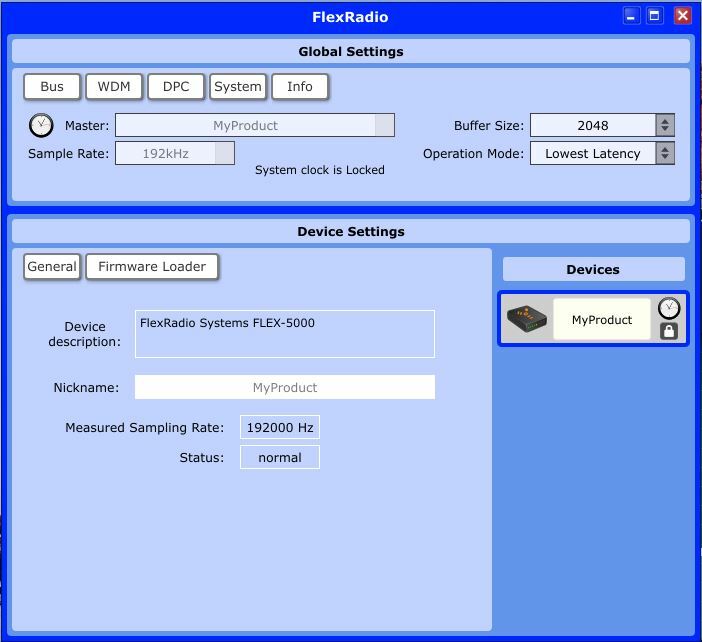 These are settings determined from reading articles on the Flex-Radio web site along with others I could find. One thing I was trying to accomplish was keep the latency low. NOTE: I have the “MS per int” set at 5. 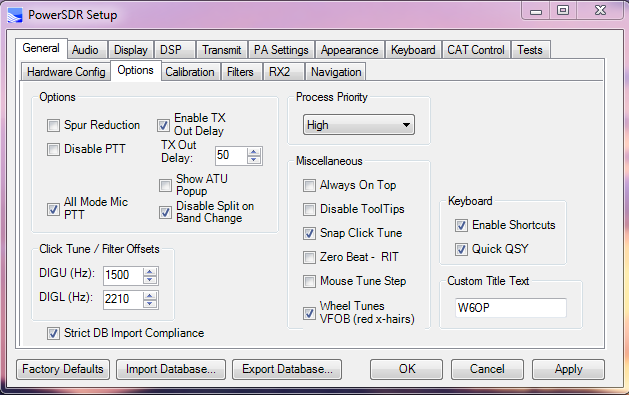 If you have a slower processor you may need to have it set at 10 or JT65 and other programs may not receive well. Note: I have since upped mine to 7 as I was having some audio pops and dropouts. Once you have the cables set you can go to the Windows Control Panel and find where the audio devices are managed. 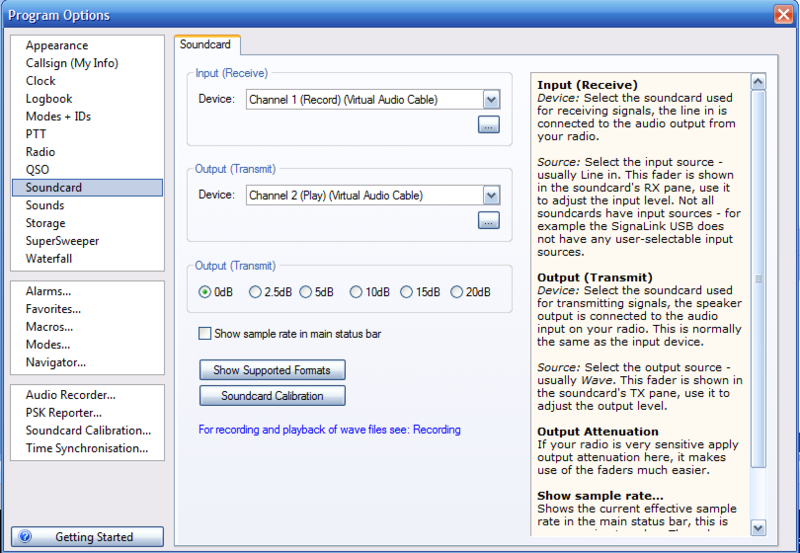 Just search for Manage Audio, easier than hunting around. You will see in both the Playback and Recording tab they are conveniently labeled “Line 1” and “Line 2”. Later on you will find that very confusing as you won’t know in from out. I went ahead and renamed them as shown. Just select the one you want to rename, click properties, and right at the top put in the name you want. Its further confusing because in the VAC documentation the input is often the output. 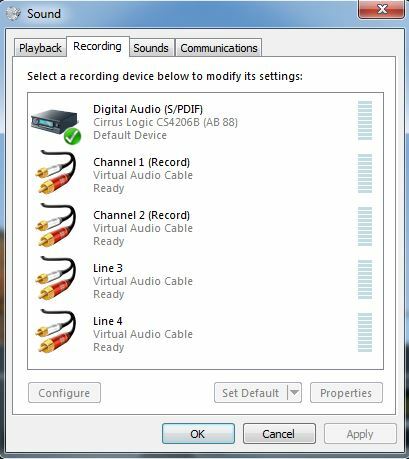 You feed audio into what I would consider the output of the cable. Just don’t over think it and everything will work. 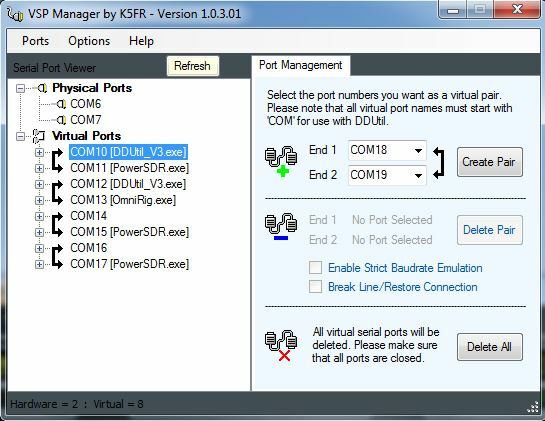 After I finished the audio setup I ran VSP Manager to create the com ports I would need. You could also use com0com if you want. I already knew how many I needed but don’t worry about it, add one and add more later if needed. I put my com ports up high from habit with Windows PCs that always seem to have all the lower numbers taken up. I have heard there may be some programs that won’t work with com ports over com10 but I haven’t run across any. Also, it leaves my lower com ports empty in case I add and USB gear that emulates a com port. I did end up with one device on a lower port. I have a Tokyo Hi-Power HL-15K amp that will auto band switch. 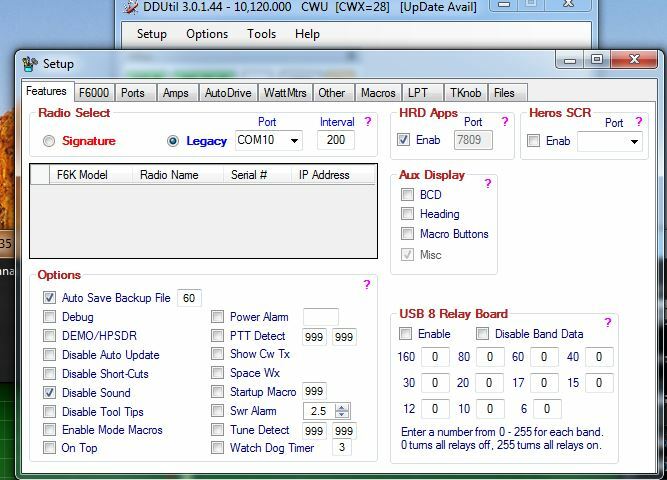 I use a USB CI-V adaptor to control it through DDUtil and the device installed itself on com 6. Now it was time to set up DDUtil. This can be a daunting task the first time! There are just so many settings you don’t know what to do. Fortunately it really only takes a little configuration initially and you can configure more as you add more functions and get to know the program better. Configured here is one end of the com port pair that will talk to Power SDR. I set the polling at 200 since I want my amp to switch bands right away if the radio switches bands. 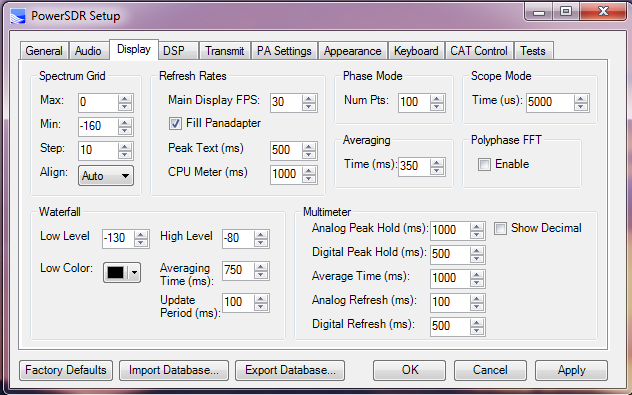 Setting the delay shorter may speed up things but also increase your CPU utilization. I you aren’t aware, 1000 ms = 1 second so work it out from there, 250 ms = 1/4 second, etc. 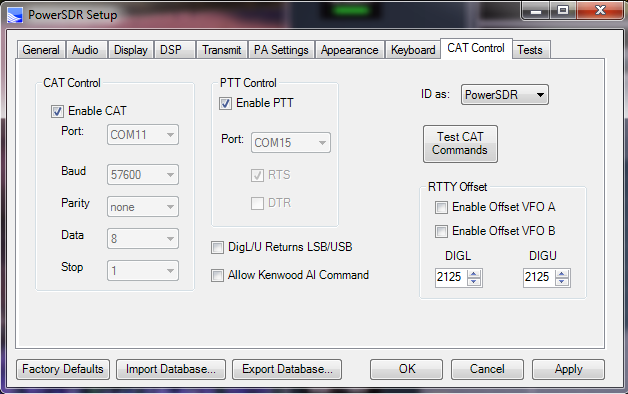 The RCP ports are other com ports that need to talk through DDUtil to the Flex 3000/5000 CAT port. There is also a convenient section to the right to type in comments documenting how everything is connected. 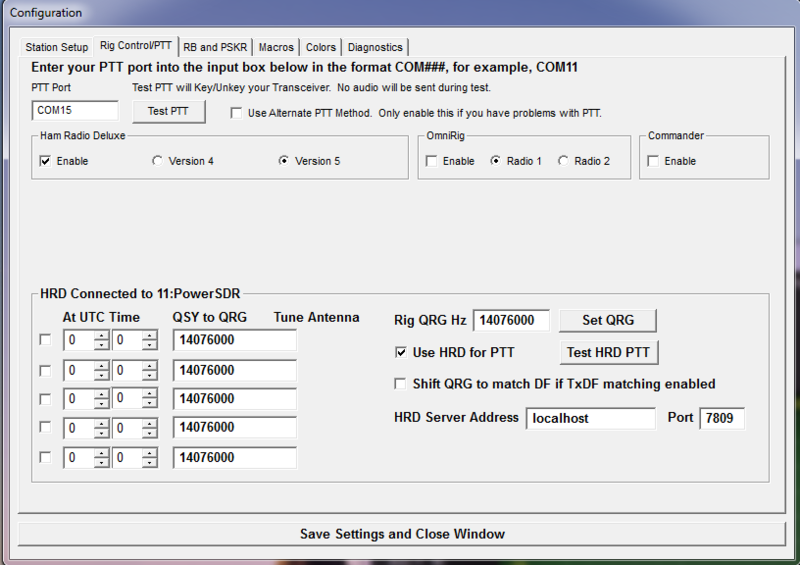 I have an RCP Port with Com 12 to talk to Omni Rig for CW Skimmer frequency data and control. 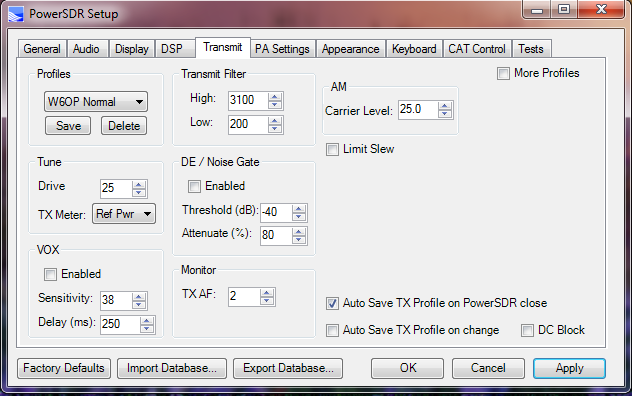 That way you can change the rigs frequency by clicking on a signal in CW Skimmer. 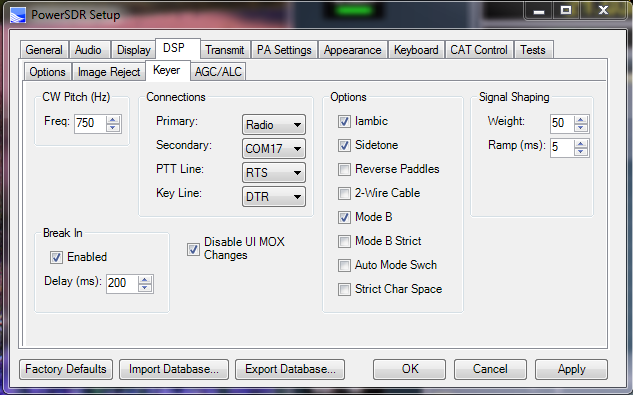 I use the Amps tab to connect my amp on the CI-V cable. The Tokyo Hi-Power emulates an Icom PW-1 in my case. It could also be connected via a serial port or BCD. The Mini Deluxe functionality is now built into DDUtil. Next I configured Mini-Deluxe. 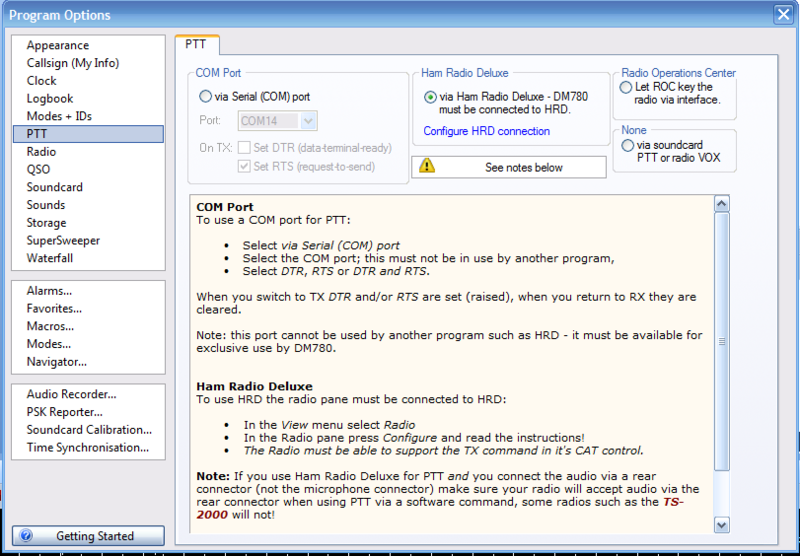 I set the PSDR port to point to the other end com port that is specified in DDUtil in the RCP tab. I changed the update intervals and left everything else at the defaults. I am sure some will say I set the intervals too short but I have plenty of CPU power and I like updates to occur quickly. I have no idea what the RIOXX/DDUtil tab is for. Maybe someone can leave a comment explaining it. 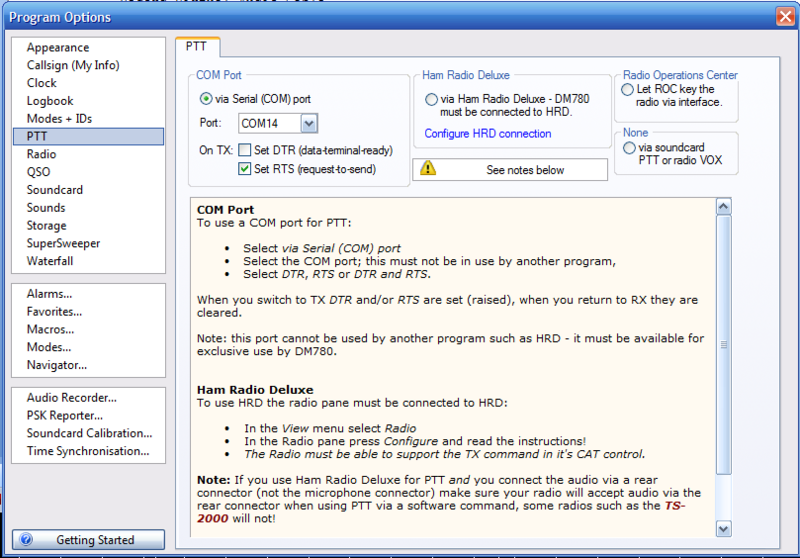 Now we get to the HRD Logbook and DM780 configuration parameters. They are pretty simple once you understand what is happening. With the HRD Logbook we need frequency and band data and we are pointing to Mini-Deluxe DDUtil since we aren’t going to be running the main HRD program. Since Mini-Deluxe DDUtil emulates HRD you can just use the defaults. To connect to the logbook just use the default settings and make sure Connect at Startup is checked. Next, set up the sound devices for DM780 as shown below. 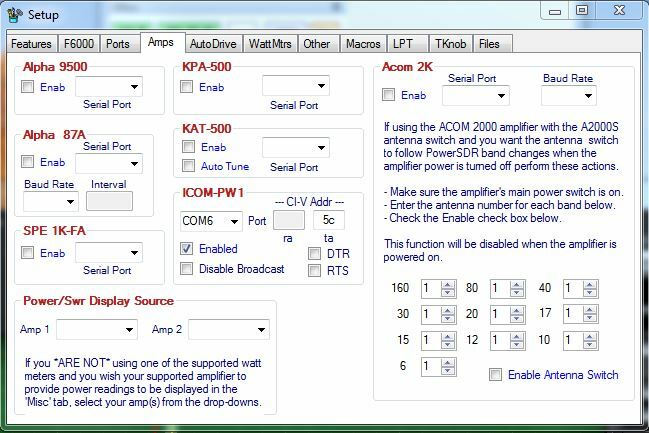 For DM780 we need frequency data which we get from the logbook and audio in/out and a way to key the rig. There are two ways to do the keying and I don’t know which is the best but both work fine. 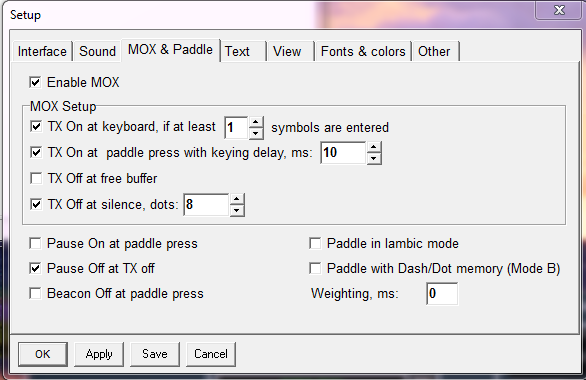 You can key the Flex directly as shown in the first image or via software through Mini-Deluxe (HRD). 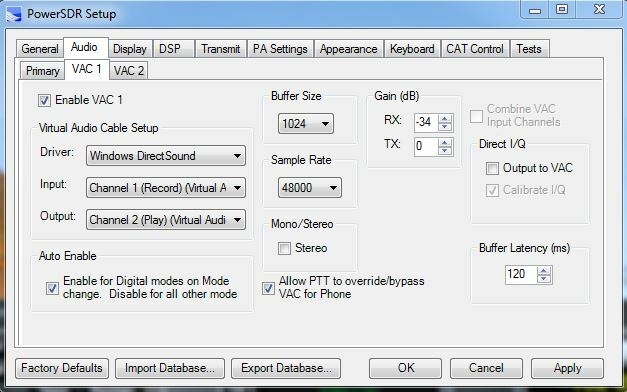 K9DUR VoiceKeyer is easy to get going, just configure it as shown below. 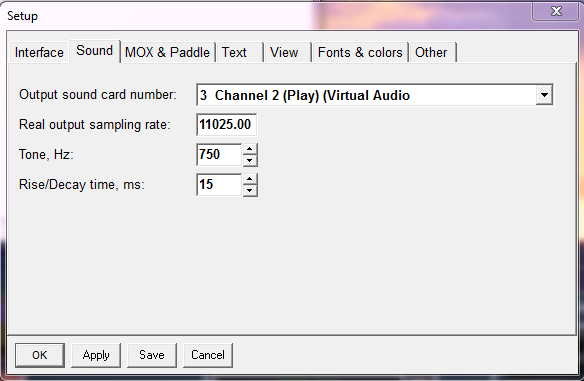 You may want to leave the Real Soundcard Sampling Rate at 11025, it will give you a wider panorama display so you can see the other stations when working split. I only run one digital/CW mode at a time so I just re-use my VAC connections instead of creating new ones. If you want to run something like DM780 and JT65-HF at the same time you need to create additional Virtual Audio Cables. 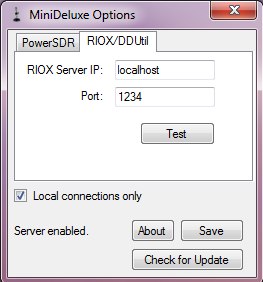 I have the Rig Control set to HRD and it uses Mini Deluxe DDUtil instead. Now we finally get to the PSDR Configuration. 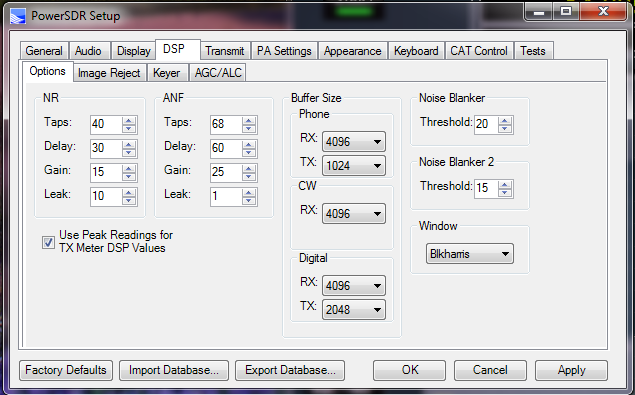 These are my current settings, I always try to tune the parameters a little so they may change.